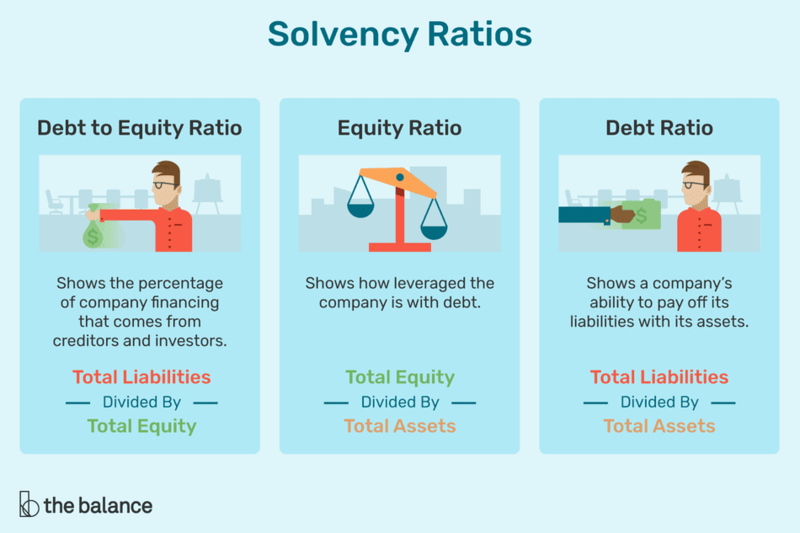 What Are Solvency Ratios and What Do They Measure? Solvency ratios measure the ability of a company to pay its long-term debt and the interest on that debt. Solvency ratios, as a part of financial ratio analysis, help the business owner determine the chances of the firm's long-term survival. Solvency ratios are sometimes confused with liquidity ratios. Both assess a company's financial health. But solvency ratios assess the company's long-term health evaluating long-term debt and the interest on that debt; liquidity ratios assess the company's short-term ability to meet current obligations and turn assets into cash quickly. What Are Solvency Ratios Good For? Solvency ratios are of interest to long-term creditors and shareholders. These groups are interested in the long-term health and survival of business firms. In other words, solvency ratios have to prove that business firms can service their debt or pay the interest on their debt as well as pay the principal when the debt matures. Solvency ratios also help the business owner keep an eye on downtrends that could eventuate in a possible bankruptcy. As the debt/asset ratio increases, the likelihood of bankruptcy also increases as the firm is financed more and more with debt as opposed to equity sources. The Total Debt/Total Assets Ratio measures how much of the firm's asset base is financed using debt. If a firm's debt ratio is .5, that means for every dollar of debt there are two asset dollars, or, putting it another way, that the firm's equity totals twice its debt. The Equity Ratio explains how much of the company is owned by its investors. The Equity Ratio is calculated by dividing total equity by total assets. It answers a basic but very important question: If the company goes out of business after it pays all liabilities, how much will be left for its investors? Interest Earned measures a company's ability to meet its long-term debt obligations. It's calculated by dividing corporate income before interest and income taxes (commonly abbreviated EBIT) by interest expense related to long-term debt. What Is a Good Solvency Ratio? There's no one-size-fits-all good solvency ratio. In order to evaluate a given firm's solvency ratio, you need to compare it with the industry average. One way of quickly getting a handle on the meaning of a company's solvency ratios is to compare them with the same ratios for a few of the dominant players in your firm's financial sector. Relatively minor deviations from the ratios of the dominant players (which will also differ from one to another) are likely not meaningful. If one of the ratios shows limited solvency, that's a problem. If several of these ratios all point to low solvency, that's a determining issue. For a potential investor, for instance, these are serious indications of problems ahead; such a company is unlikely to fare well in a stressful economic environment.